Falling fuel prices are set to unlock huge cost savings for airlines next year, but many investors are worried about potential fare wars. Airline stocks have plunged in the past few days. While general stock market volatility was a key factor behind the declines, a downgrade of the entire airline sector by analyst Hunter Keay of Wolfe Research accelerated the downward spiral on Friday. Shares of American Airlines (NASDAQ:AAL) have plunged about 17% over the past week. 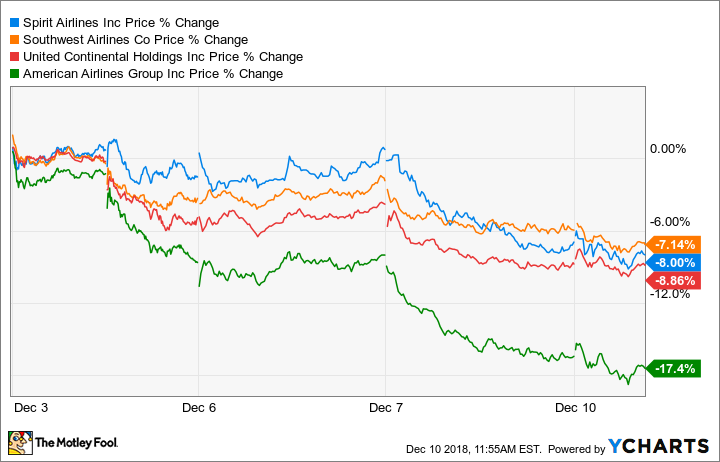 Other major airlines, including United Continental (NASDAQ:UAL), Southwest Airlines (NYSE:LUV), and Spirit Airlines (NYSE:SAVE), are sporting losses of 7% to 9%. Airlines weekly stock performance, data by YCharts. Keay's downgrade is premised on the belief that low oil prices are bad for airline stocks, because they encourage airlines to expand too quickly, undermining their pricing power. However, this big sell-off looks like a buying opportunity, because fuel cost savings will likely outweigh any unit revenue weakness. Oil prices surged in the second half of 2017 and during most of 2018, after OPEC and several other oil producers (led by Russia) agreed to reduce production to prop up the market. This cost pressure pinched profit margins at most airlines. But on the bright side, it has helped tamp down some of the fare wars that periodically swept across the industry from 2015 to 2017. However, oil prices have plunged since early October, on fears that supply is outpacing demand again. The market price of jet fuel peaked at around $2.35 per gallon during the first week of October, but it has since fallen below $1.80. As a result, airlines' fuel costs are now on track to decline year over year in 2019, in a sharp reversal from the outlook just two months ago. This should lead to surging profits across the industry -- unless airlines resume their fare wars and unit revenue trends turn negative again. However, Keay believes that airlines will "behave poorly" -- i.e. add too much capacity -- if oil prices stay low. As a result, he downgraded the entire sector from overweight (the equivalent of buy) to underweight (the equivalent of sell) on Friday. He also downgraded several individual stocks, including American Airlines and Spirit Airlines. American stock dropped last week due to fears about future fare wars. Image source: American Airlines. Do low oil prices kill capacity discipline? On the surface, Keay might seem to have a valid point. Fuel prices plunged in the second half of 2014, and in 2015, Spirit accelerated its capacity growth to 30% from 17.9% a year earlier. Meanwhile, Southwest grew its capacity 7.2% in 2015, following a mere 0.5% increase in 2014. As a result, revenue per available seat mile (RASM) dipped 1.5% at Southwest and plunged 14.7% at Spirit during 2015. American and United both posted mid-single-digit RASM declines that year. However, this isn't the whole story. In April 2014 -- well before oil prices began to fall -- Spirit was already planning to increase its capacity by 30% in 2015. The change in its growth rate was simply due to the timing of when it could get new aircraft from Airbus. The fact that it lined up with a drop in oil prices was just a coincidence. Southwest was also already planning to accelerate its growth rate in 2015 before oil prices fell. It saw a big opportunity to expand in Dallas after restrictions on long-distance flights at Love Field were eased in late 2014. The end of the AirTran merger integration process also freed up more capacity for growth. In April 2014, Southwest estimated that it would end 2015 with about 695 aircraft in its fleet. It ultimately finished the year with 704 aircraft -- just 1.3% higher than its projection (which was made before oil prices fell). As for the legacy carriers, American and United increased capacity 1.2% and 1.6%, respectively, in 2015. Clearly, neither one made major capacity changes based on the decline in fuel prices. Conversely, United decided about a year ago to accelerate its growth rate by 4% to 6% for the 2018 to 2020 period, in order to regain domestic market share. It stuck with that plan even as fuel prices moved steadily higher during 2018. It would be naive to suppose that low oil prices have no impact on airlines' capacity decisions. With lower oil prices, more routes can be profitable for airlines, as it becomes possible to earn higher profits even with slightly lower unit revenue. Over time, this encourages some amount of incremental capacity growth. However, in the past few years, fluctuations in airlines' growth rates have been driven primarily by strategic decisions that had little or nothing to do with oil prices. Furthermore, order backlogs at Boeing and Airbus are so long at this point that airlines can't just accelerate their growth rates on a whim. Thus, low oil prices won't have a significant impact on airlines' 2019 capacity plans. Even in 2020, the impact will probably be relatively minimal. Meanwhile, the roughly $0.50 per gallon decline in jet fuel prices over the past two months represents a margin tailwind of 5 percentage points or more for most airlines. Investors should embrace the cost savings, which will likely enable strong profit growth across the airline industry next year. With most airline stocks already trading at bargain valuations, the recent sell-off looks like a great buying opportunity for investors willing to ride out some potential volatility.